Ilsemannite: Mineral information, data and localities. After Johann Christoph Ilsemann (1727-1822), a former Mining Commissioner at Clausthal, Harz, who published an early study of molybdenite (1787). Note that there are numerous different and very complex heterovalent molybdenum oxide molecules forming amorphous blue substances. 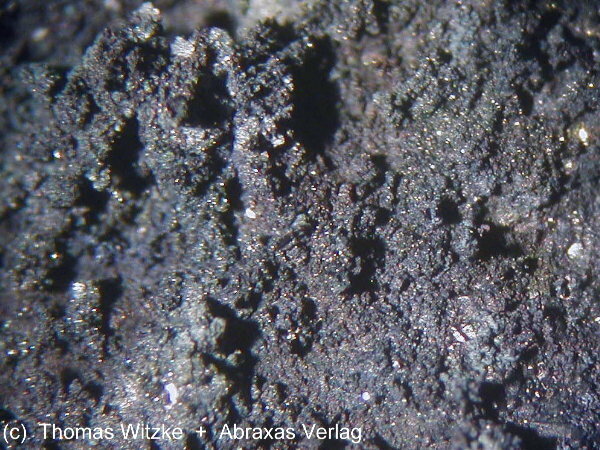 Most likely the "ilsemannites" at different localities, formed under different conditions, are not the same compound and may even be mixtures of several different compounds. Consequently "ilsemannite" does not really deserve mineral species status and may eventually turn out to be several different species when technology advances to when we can better characterize very thin amorphous films. Ilsemannite was once thought to be responsible for the blue colour of "blue waters" of the Idaho Springs area, known to Indians, but it was later shown that rather more complex, up-to-200-metal-atoms compounds may be the cause. See also the visually similar mourite. Earthy masses or crusts; as a stain or disseminated pigment. Tugarinovite 9 photos of Ilsemannite associated with Tugarinovite on mindat.org. Jordisite 7 photos of Ilsemannite associated with Jordisite on mindat.org. Anhydrite 6 photos of Ilsemannite associated with Anhydrite on mindat.org. Mourite 4 photos of Ilsemannite associated with Mourite on mindat.org. Halotrichite 3 photos of Ilsemannite associated with Halotrichite on mindat.org. Iriginite 3 photos of Ilsemannite associated with Iriginite on mindat.org. Carnotite 3 photos of Ilsemannite associated with Carnotite on mindat.org. Quartz 3 photos of Ilsemannite associated with Quartz on mindat.org. Molybdenite 3 photos of Ilsemannite associated with Molybdenite on mindat.org. Rostite 2 photos of Ilsemannite associated with Rostite on mindat.org. Höfer, H. (1871) Ilsemannit, ein natürliches Molybdänsalz. Neues Jahrbuch für Mineralogie, Geologie und Palaontologie: 1871: 566-570. Horton, F.W. (1916) Molybdenum - its ores and their concentration. United States Bureau of Mines and Geology Bulletin 111: 132p. : 111. Schaller (1917) Washington Ac Sc., Journal: 7: 417. Cook, C.W. (1922) A new occurrence of ilsemannite. American Journal of Science: 4: 50-52. Hess, F.L. (1925) Ilsemannite at Ouray, Utah. United States Geological Survey, Bulletin 750A: 750: 1-16. Palache, C., Berman, H., Frondel, C. (1944) The System of Mineralogy of James Dwight Dana and Edward Salisbury Dana Yale University 1837-1892, Volume I: Elements, Sulfides, Sulfosalts, Oxides. John Wiley and Sons, Inc., New York. 7th edition, revised and enlarged: 603-604. Staples, L.W. (1951) Ilsemannite and jordisite. American Mineralogist: 36: 609-614. Imants Kavalieros (1994) Journal of Geochemical Exploration, 50, 479-491. Field observations, Dr Amir Akhavan and Alfredo Petrov, 4-2014. P.M. Kartashov data; Belakovski D.I.. 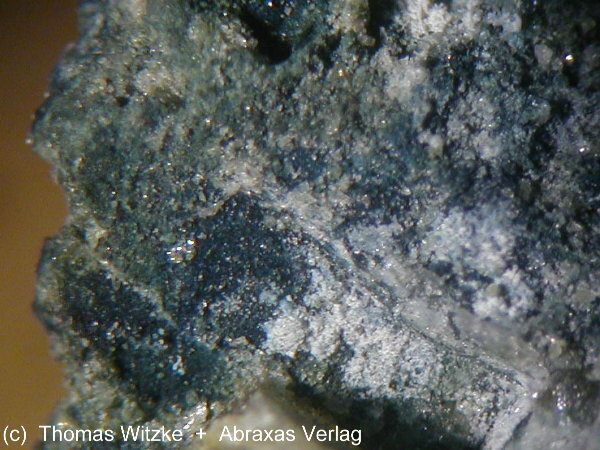 Die Mineralien der brennenden Kohlefloze von Ravat in Tadshikistan, Lapis, 1990, N 12 p.21-26. (in German); Nasdala, L., & Pekov, I. V. (1993). 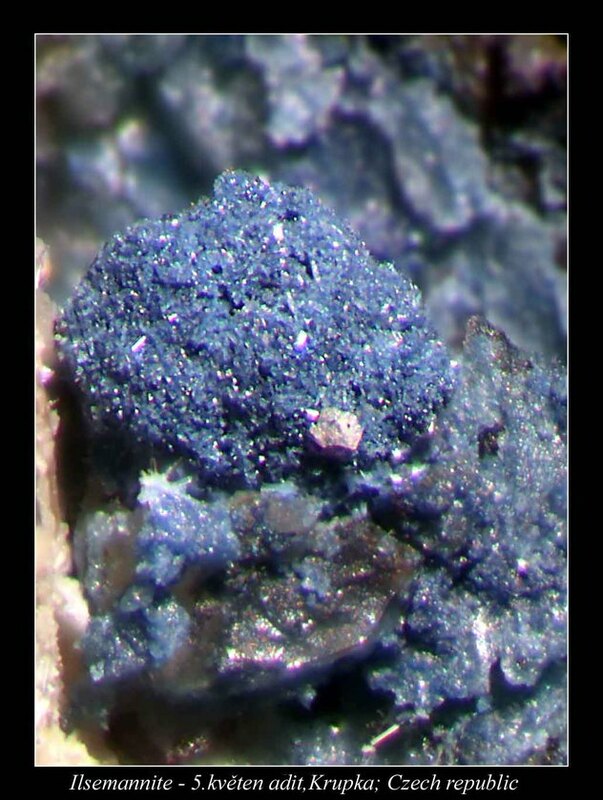 Ravatite, C14HIO, a new organic mineral species from Ravat, Tadzhikistan. Eur. J. Mineral, 5, 699-705.
ⓘ Billingham anhydrite mine ? Raymond, L.R. (1959) Recent Secondary Minerals in the Billingham Anhydrite Mine. Mineralogical Magazine, vol. 32, n° 245, 172-175.; Embrey, P.G. (1978) Fourth supplementary list of British minerals. Mineralogical Magazine, vol. 42, n° 322, 169-177. Anthony, J.W., et al (1995), Mineralogy of Arizona, 3rd.ed. : 258; Witkind, I.J. & R.E. Thaden (1963), Geology and uranium-vanadium deposits of the Monument Valley area, Apache and Navajo Cos., AZ: 117. Williams, S. & Cesbron, F. P. (1995). Wupatkiite from the Cameron uranium district, Arizona, a new member of the halotrichite group. Mineralogical Magazine, 59, 553-556.; Bollin, E. M., & Kerr, P. F. (1958). Uranium mineralization near Cameron, Arizona. In Guidebook of the Black Mesa Basin, northern Arizona: New Mexico Geological Society, 9th Field Conference Society Guidebook (Vol. 9, pp. 161-168). Anthony, J.W., et al (1995), Mineralogy of Arizona, 3rd.ed. : 258, 431; Petersen, R.G., et al (1959), An occurrence of rhenium associated with uraninite in Coconino Co., AZ, Econ.Geol. : 54: 254-267. Palache, Charles, Harry Berman & Clifford Frondel (1944), The System of Mineralogy of James Dwight Dana and Edward Salisbury Dana Yale University 1837-1892, Volume I: 7th edition: 604; Murdoch, Joseph & Robert W. Webb (1966), Minerals of California, Centennial Volume (1866-1966): California Division Mines & Geology Bulletin 189: 227. Troxel, Bennie Wyatt & P.K. Morton (1962), Mines and mineral resources of Kern County, California: California Division Mines & Geology County Report 1, 370 pp. : 330; Pemberton, H. Earl (1983), Minerals of California; Van Nostrand Reinholt Press: 79, 341. Troxel, Bennie Wyatt & P.K. Morton (1962), Mines and mineral resources of Kern County, California: California Division Mines & Geology County Report 1, 370 pp. : 333; Pemberton, H. Earl (1983), Minerals of California; Van Nostrand Reinholt Press: 341. Cook, C.W. (1922), A new occurrence of ilsemannite (Gibson, Shasta County, California): American Journal of Science, 5th. Series: 4: 50-52; Murdoch, Joseph & Robert W. Webb (1966), Minerals of California, Centennial Volume (1866-1966): California Division Mines & Geology Bulletin 189: 186, 227; Pemberton, H. Earl (1983), Minerals of California; Van Nostrand Reinholt Press: 341.
ⓘ Cucomungo mine (Siskon mine) ? NBMG Bull 78 Geology and Mineral Deposits of Esmeralda County, Nevada; NBMG Open File Report 79-3; U.S. Geological Survey (2005) Mineral Resources Data System: U.S. Geological Survey, Reston, Virginia. www.excaliburmineral.com; U.S. Geological Survey, 2005, Mineral Resources Data System: U.S. Geological Survey, Reston, Virginia. ; Page, L. R.; Stocking, H. E.; Smith, H. B. (1956) Contributions to the geology of uranium and thorium by the United States Geological Survey and Atomic Energy Commission for the United Nations International Conference on Peaceful Uses of Atomic Energy, Geneva, Switzerland, 1955. USGS Professional Paper 300 pp361-370.